On May 20, 2017, another Apple-1 will hit the auction block. MacRumors reports that it will include "the original manual and documentation, the receipt for the motherboard and cassette recorder, and even a record of telephone conversations with Steve Jobs and Wozniak." It appears to be Apple-1 #14, as detailed in Mike Willegal’s Apple-1 Registry. 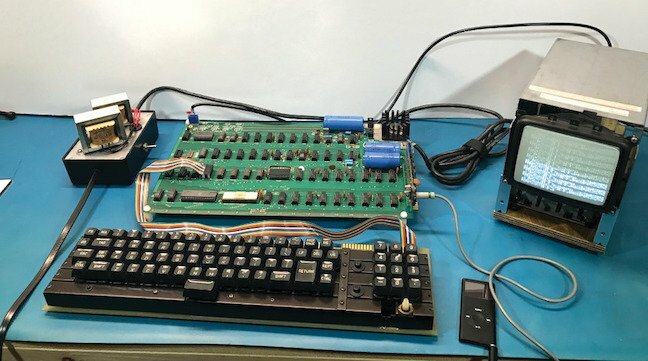 This is not the first time an Apple-1 has been sold by German auction house Breker: they sold one in November 2012 for $640,000, and another in May 2013 for $671,400. Expect this one to fetch a similarly high price. UPDATE (May 22, 2017): This Apple-1 sold at auction for only €110,000 ($130,000). Prolific hardware developer Mike Willegal has handed off management of his original Apple-1 clone, the Mimeo 1. The boards were first made commercially available in 2010 and "have been sold to vintage computer buffs around the world", writes Willegal. "However, the learning part of the process, which is one of things that keeps me interested in my hobbies, has not been there over the past few years." Henceforth, the Mimeo 1 will be developed and distributed by Corey Cohen, an Apple-1 enthusiast who was previously profiled in the New York Times for his work on restoring an original Apple-1 sold at Christie’s auction house. Find the Mimeo 1’s new home at Cohen’s website. The Sydney Morning Herald has a nice write-up on today, April 11th 2016, being the Apple 1’s 40th Birthday. Is the Apple-1 “gold rush” over? This Apple-1, described by Bonhams Auctions as, “in nearly perfect condition” was put up for auction in September with a starting bid of $300,000. It bears the number 01-0059, indicating it was one of the batch Apple sold to The Byte Shop. Bonhams expected the computer to go for as much as $500,000 and stated, “The customer had only used the Apple-1 once or twice, and Mr. Romkey set it on a shelf, and did not touch it again.” It even has the coveted white ceramic 6502 CPU still in place and was tested as functional, but BBC News reports that it was one of only two lots in Bonhams’s “History of Science and Technology” auction that failed to sell. Is the “gold rush” over? Alex Bowen’s Arduino-based Apple 1 emulator was posted on Hackaday. You can read more about his college advanced microprocessors project here. Queue the sad trombone and read about it here. Some of you may remember my earlier work on PLASMA, the Proto Language AsSeMbler for Apple. Some of you may even know it will be the language of Lawless Legends (https://www.facebook.com/LawlessLegends). But now, with a flurry of previous concepts and new ideas developed for the LL implementation, comes PLASMA 123. Why 123? Because it runs on the Apple 1, ][, and ///. “No way!”, you say. Way. And it runs the exact same PLASMA modules (user programs and libraries) on all three systems, without modification. That’s the power of a VM. But this VM was designed specifically for the Apple II (both 64K and 128K fully utilized) and the Apple /// (uses extended memory addressing, up to 512K), from the beginning. The Apple 1 got a quick port because of the awesome CFFA1 (Rich may still have some left). There are only two sample PLASMA programs to run on this image: HELLO and TEST. Run them, as documented above, with ‘+hello’ and ‘+test’. The HELLO module is pretty simple. The TEST module actually loads a module dependency, TESTLIB, as it runs. It is just my language test coverage module, using a bunch of different aspects of PLASMA. If you see a bunch of junk on the screen with HELLO on your Apple ][ or ][+, that means you don’t have a lower-case adapter and I haven’t forced the output on those machines to upper case yet. So now we have the grand unifying environment for the 8 bit Apples. And it’s fast. I developed some new interpreter technology for this version: about 3 times slower than native compiled 6502, but about 10 times as dense, and code doesn’t take up precious main memory (on 128K Apple II or Apple III). You can still write ASM functions inside your PLASMA module for those times that speed is critical above all else.